Movies about writers rarely succeed. They try to visualize the creative process, but wind up with a lot of shots of furrowed brows and banging typewriters. "Rebel in the Rye," based on a recent biography of J. D. Salinger, comes closer than most to explaining creative genius. Nicholas Hoult plays the author as a young man, searching for his voice and place, wanting to write but only getting discouragement from his father. Salinger ultimately writes "The Catcher in the Rye." He bases his character Holden Caulfield on his own troubled youth, including a difficult relationship with socialite Oona O'Neill, who married the much older Charles Chaplin not long after they part. 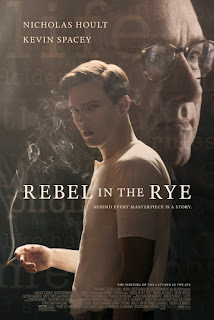 "Rebel in the Rye" gets interesting as it portrays Salinger's war experience, including the D-Day landing and months of PT SD. Salinger finds comfort in eastern meditation, which unlocks his talent. The success of "The Catcher in the Rye" comes with a price. Salinger becomes a recluse. Set in the years before and after World War II, "Rebel" goes overboard on period touches. A good cast includes Kevin Spacey as Salinger's teacher/mentor. Spacey gained 50-60 pounds for the role. This might have helped Spacey, but I found it distracting. Sarah Paulson plays Salinger's literary agent, wearing lipstick so thick I wondered how she possibly stacked that much on her lips. Even with these distractions, actor Nicholas Hoult comes close to showing a writer's struggle. "Rebel in the Rye,' 2½ stars, rated" PG-13. Does it deliver what it promises? Biography of American writer J. D. Salinger. Is it entertaining? Interesting, and sometimes fascinating. Is it worth the price of admission? Watchable.